Explanation: This color view from Titan gazes across a suddenly familiar but distant landscape on Saturn's largest moon. The scene was recorded by ESA's Huygens probe after a 2 1/2 hour descent through a thick atmosphere of nitrogen laced with methane. 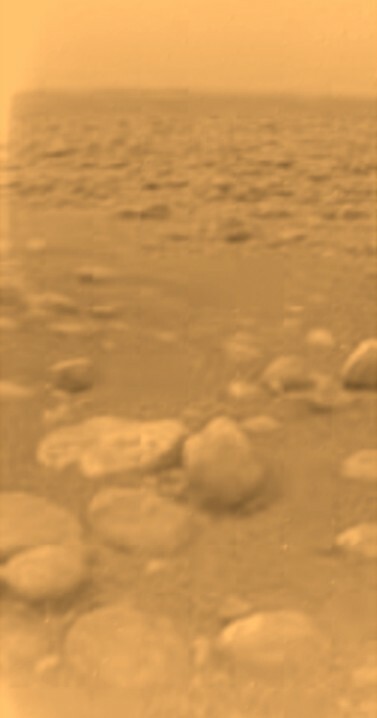 Bathed in an eerie orange light at ground level, rocks strewn about the scene could well be composed of water and hydrocarbons frozen solid at an inhospitable temperature of - 179 degrees C. The light-toned rock below and left of center is only about 15 centimeters across and lies 85 centimeters from the probe. Touching down at 4.5 meters per second, the saucer-shaped probe is believed to have penetrated 15 centimeters or so into a surface with the consistency of wet sand or clay. Huygen's batteries are now exhausted but the probe transmitted data for more than 90 minutes after landing. Titan's bizarre chemical environment may bear similarities to planet Earth's before life evolved.